Etherow Country Park was one of Britain's first country parks. Established in 1968 around an old cotton mill, the park has steadily grown in size and popularity and now attracts over a quarter of a million visitors every year. The park lies within easy reach of the Stockport and Manchester conurbations and also of the un-spoilt countryside of the Pennines. The park is the halfway point of the 12 mile Valley Way Footpath which links Vernon Park in Stockport with Woolley Bridge on the Tameside/Derbyshire border. The Goyt Way, a ten mile footpath to Whaley Bridge, also starts at Etherow Country Park. Leaflets are available for these paths at the visitors centre. 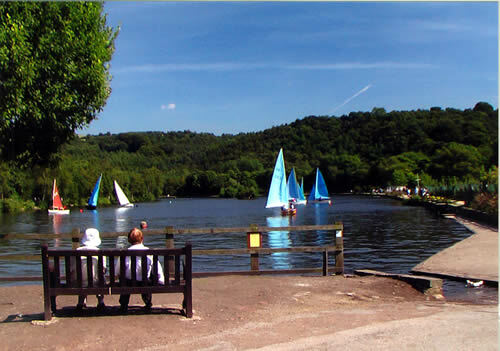 Etherow Country Park covers an area of 240 acres at the heart of the Etherow-Goyt Valley. The park offers a variety of leisure pursuits such as bird watching, rambling and nature study. Sailing, model boating and angling are also available by club membership. The park also plays host to the Marple & District Round Table Raft Race each summer. Motorised wheelchairs are available free of charge to allow disabled visitors to enjoy the park's many attractions (booking recommended, especially at weekends). A Visitors Centre, cafeteria and toilets (including disabled facilities) are located next to the car park. There is space for 116 cars (pay and display parking). Etherow Country Park is rich in wildlife. The park is home to over 200 species of plants and more than a hundred species of birds have been recorded here. The park has its own nature reserve which is a designated Site of Special Scientific Interest (SSSI). The reserve is managed solely by Cheshire Wildlife Trust and there is now a short permissive footpath through the SSSI with access to a bird hide overlooking the River Etherow. The wide variety of habitats within the park allow an abundance of wild plants to thrive here. With the exception of mid-winter, plants are easily spotted throughout the year. Look out for flora such as Dog's Mercury, Wood Anemone, Hedge Woundwort and Common Spotted Orchid, among many others. The many areas of woodland in the park provide an ideal home for a variety of wild plants and animals. Etherow Country Park provides ideal hunting territory for a variety of birds of prey. Tawny Owls hunt frequently in the Keg woodlands. Etherow Country Park was once part of the estate of George Andrew, who built Compstall mill in the 1820's. Compstall village was also built by Andrew to house his mill workforce. The waterways which you can see today were also built by Andrew to carry water from the weir on the river to turn the mill wheel, which stood where the car park is today. Andrew was also fond of shooting and fishing and the Keg woods and pool were his own private shooting and fishing grounds. Nowadays these areas are a quiet sanctuary for a variety of wildlife. The Etherow Country Park is situated at Compstall on the B6104 between Romiley and Marple Bridge and is well signposted from the road. The Etherow-Goyt Valley Wardens are based at the park and are always pleased to give talks or guided walks by prior arrangement. Motorised wheelchairs are available free of charge to anyone who has difficulty in walking around the park. For further information please contact the Wardens.